16 November 1970: At the Lockheed California Company Plant 10, just north of Palmdale in the high desert of Southern California, test pilot Henry Baird (“Hank”) Dees, co-pilot Ralph C. Cokely (formerly a Boeing 747 test pilot), with flight test engineers Glenn E. Fisher and Rod Bray, took the new prototype Lockheed L-1011-1 TriStar, N1011, on its first flight. During the 2½-hour test flight, the airliner reached 250 knots (288 miles per hour, 463 kilometers per hour) and 20,000 feet (6,096 meters). 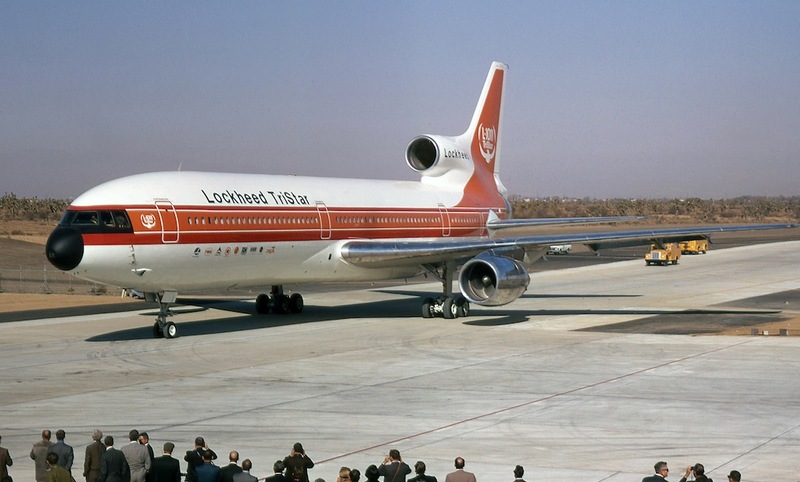 The Lockheed L-1011 TriStar is a three-engine wide body airliner designed to carry up to 400 passengers on medium or long distance routes. It is operated by a flight crew of three. The prototype, the L-1011-1 and L-1011-200 production aircraft were 177 feet, 8½ inches (54.166 meters) long with a wingspan of 155 feet, 4 inches (47.346 meters). 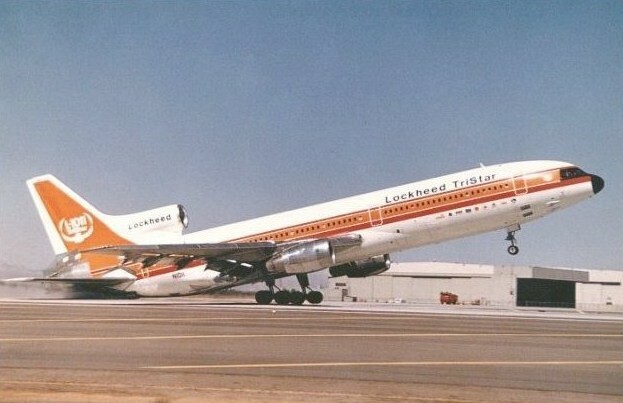 The longer range, higher gross weight L-1011-500 variant was 164 feet, 2½ inches (50.051 meters) long with a wingspan of 164 feet, 4 inches (50.089 meters). All TriStars have an overall height of 55 feet, 4 inches (16.866 meters). The interior cabin width is 18 feet, 11 inches (5.766 meters). Empty weight ranges from 241,700 pounds (109,633 kilograms) to 245,400 pounds (111,312 kilograms), while the maximum takeoff weight varies from 430,000 pounds (195,045 kilograms) to 510,000 pounds (231,332 kilograms). The L-1011-1 aircraft were powered by three Rolls Royce RB.211-22B-02 high bypass turbofan engines, producing 42,000 pounds of thrust (186.825 kilonewtons). The -200 and -500 variants used the more powerful RB.211-524B4 which produces 53,000 pounds (235.756 kilonewtons). The RB.211-22 is a “triple-spool” axial-flow turbine engine. It has a single fan stage, 13-stage compressor (7 intermediate- and 6 high-pressure stages), single combustion chamber, and 5 stage turbine section (1 high-, 1 intermediate- and three low-pressure stages). The -22B is 10 feet, 11.4 inches (3.033 meters) long and its fan diameter is 7 feet, 0.8 inches (2.154 meters). 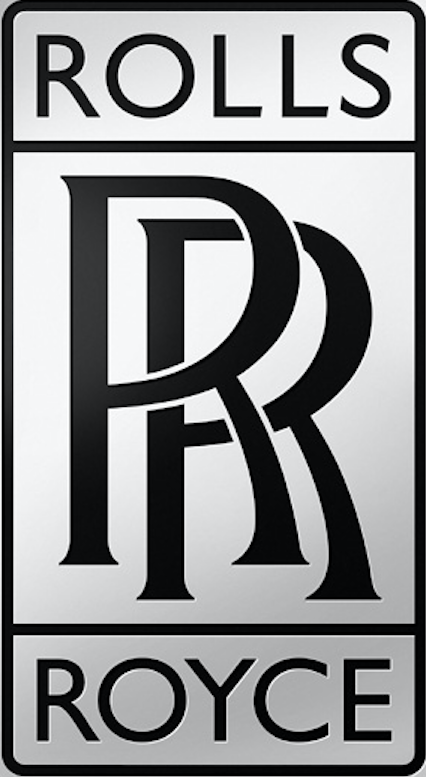 It weighs 9,195 pounds (4,171 kilograms). 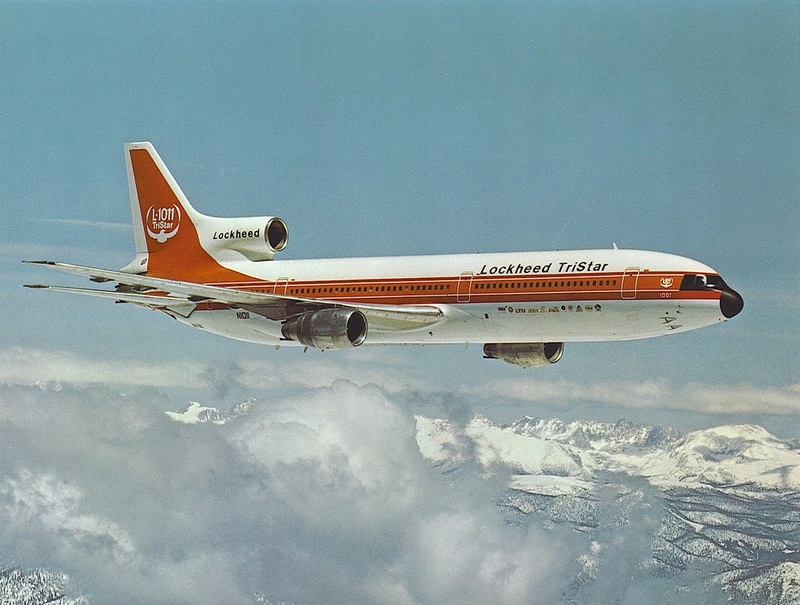 Depending on the model, the L-1011 series had a cruise speed of 520–525 knots (598–604 miles per hour, 963–972 kilometers per hour) and a maximum speed of 0.95 Mach. The service ceiling was 42,000–43,000 feet (12,802–13,106 meters). Maximum range for the long range -500 was 6,090 nautical miles (7,008 miles, 11,279 kilometers). 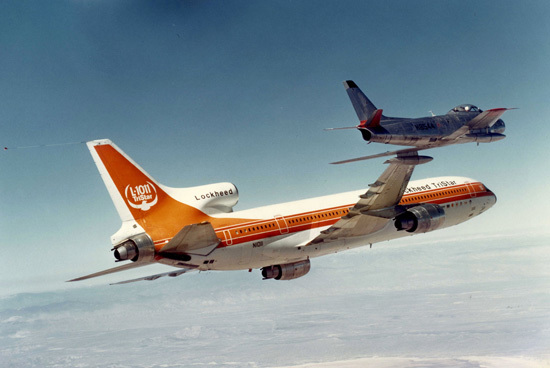 The Lockheed L-1011 TriStar was a very technologically advanced airliner for the time. It was the first to be certified for Category IIIc autolanding, in which the airplane’s automatic flight system could land the airplane in “zero-zero” weather conditions. 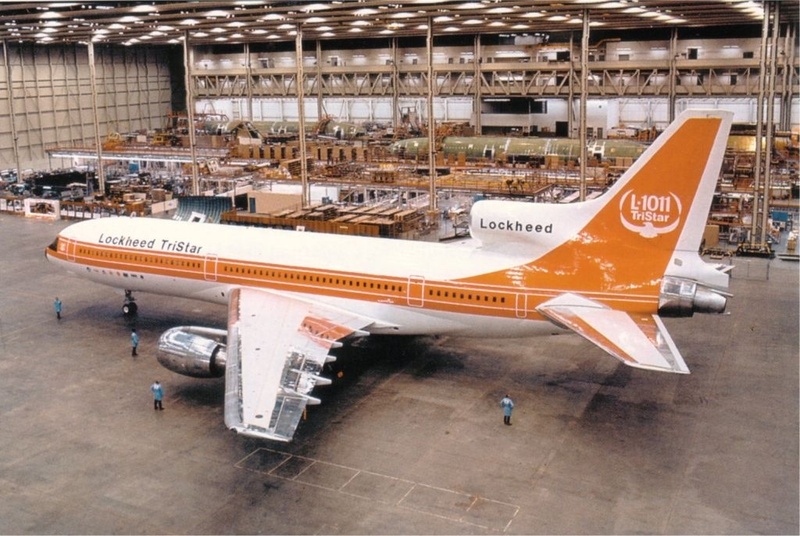 Lockheed built 250 L-1011s between 1970 and 1984. 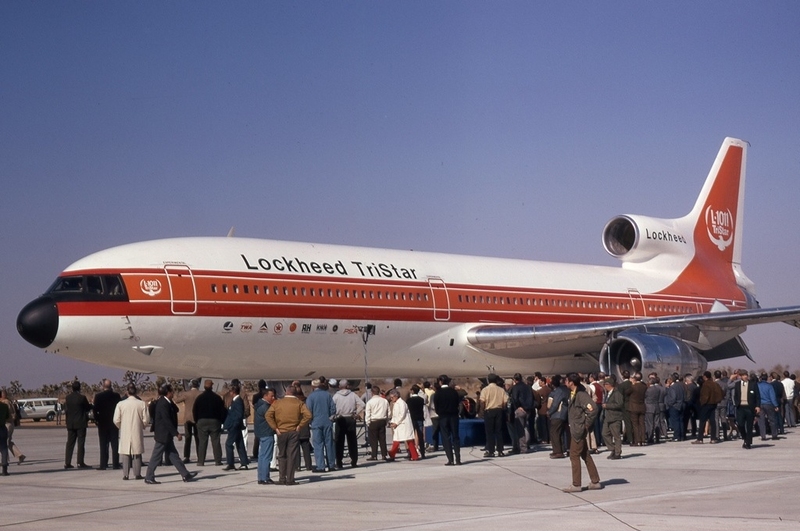 Sales were delayed because of problems with delivery of the Rolls-Royce turbofans, giving an early advantage to the competitor McDonnell DC-10, of which 446 were built. Few TriStars remain in service. The prototype, N1011, was scrapped at Ardmore, Oklahoma, in August 1996. A portion of its fuselage, painted in Delta Air Lines livery, is on display at Atlanta-Hartsfield International Airport, Atlanta, Georgia.